A canicule (the dog days), in French, is a period of time when the daytime and the night time temperatures are extremely high. We are having a canicule. That means that what few apricots that the sudden late frost left us are now ripening fast. The tomatoes are growing at an amazing speed. The first lavender is just opening its buds and I steal some of the stalks from the bees in the early morning. Pull up! Pull up! I hope you know where you are going! I knew where I was going. The garden is too hot during the day so we may as well take advantage of living near the sea. Categories: Life | Tags: canicule, garden, hot air ballon | Permalink. Since we have returned from the U.K. we have been enjoying an Indian Summer so the garden has been neglected somewhat in favour of the beach. Mescher beach is only half an hour away so it is easy to visit for a short break. Never the less, I cannot stop looking at things from a gardener’s perspective. 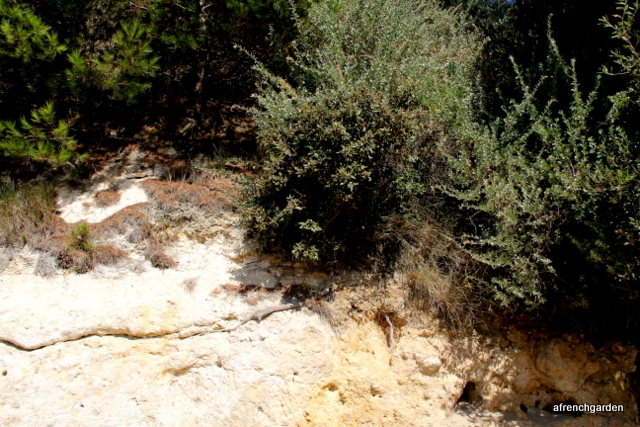 Look at these pines with their roots growing into the limestone rock. Not exactly how the gardening books would advise you to plant them. 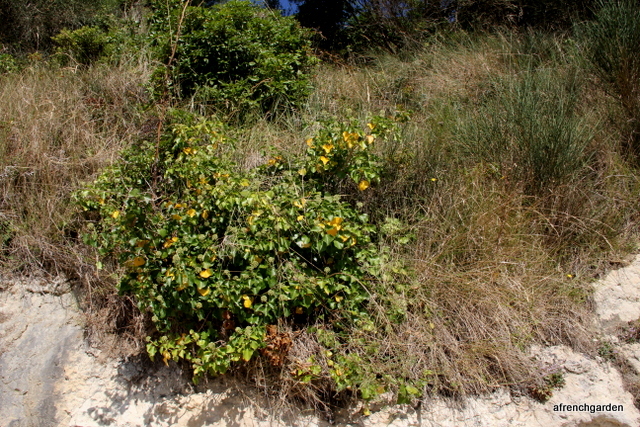 Clumps of plants with yellow flowers grow on the vertical faces of the rock. 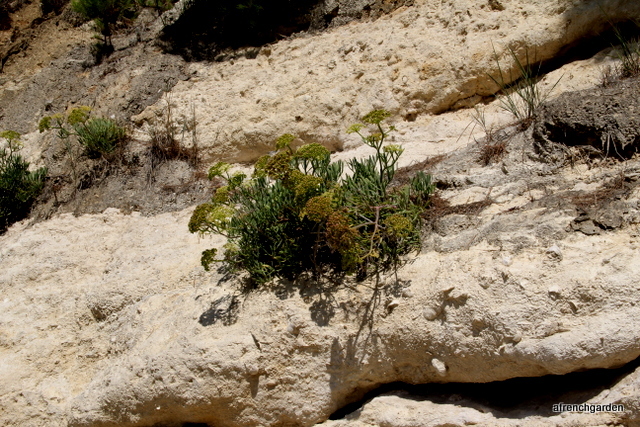 The rock samphire or Crithmum maritimum grows all over the cliff face. 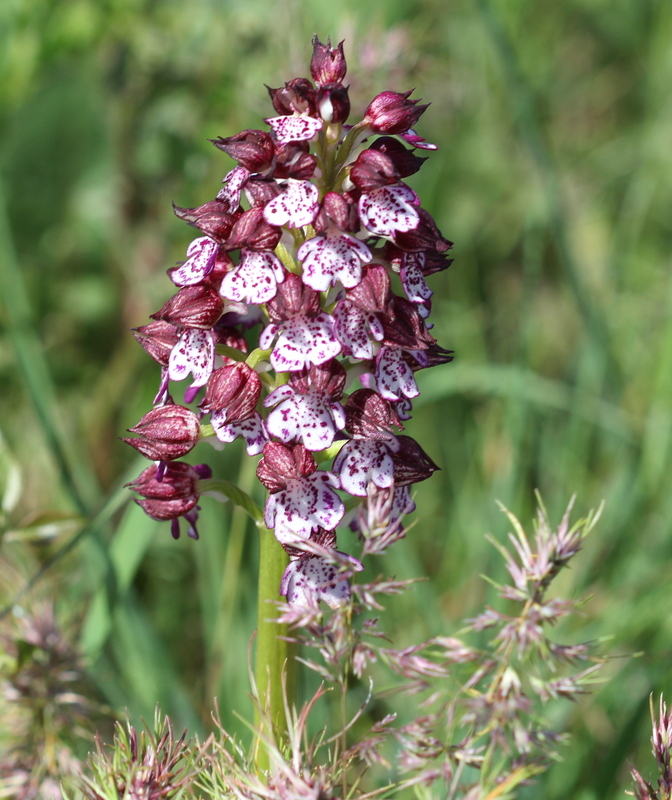 It is not the same plant as the samphires that grow more inland but is also edible and is recommended to be eaten either pickled in vinegar, raw or cooked in an omelette, but I have no personal experience of eating it. Seemingly, it is very high in vitamin C and used to be eaten by sailors to combat scurvy. A common name for it in French is “perce-pierre” (stone cutter) – very appropriate. 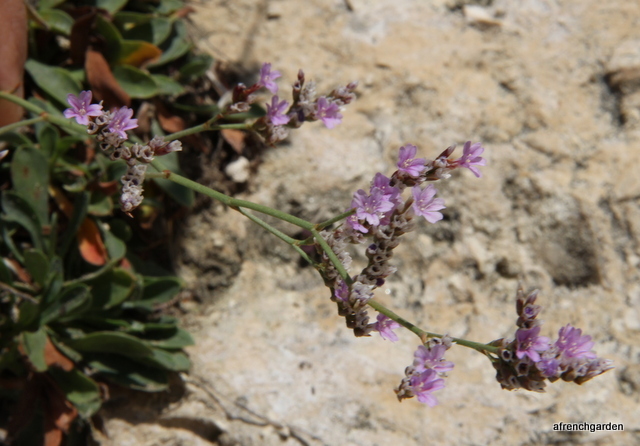 Growing alongside the rock samphire is the incredibly delicate sea lavander (Limonium vulgare). It is difficult to believe such a delicate flower could take root and flourish without special care and attention. What a beautiful place it has chosen to grow in front of a miniature grotto in the soft limestone rocks, I’m sorry the harsh light does not do justice to the fine flower stems. 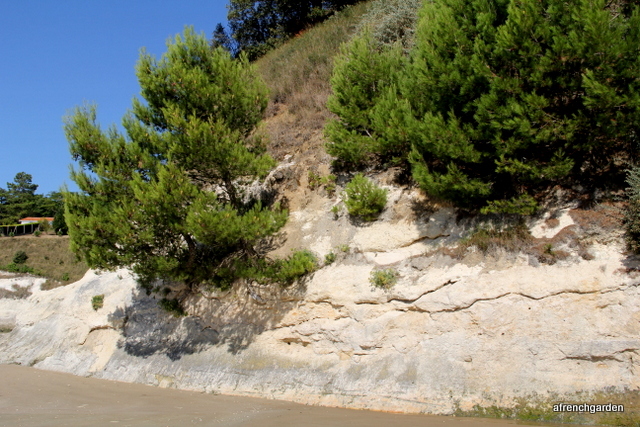 A type of oak has thrust a root through the cliff and is now completely exposed. I do not know what species of oak this is but it is able to thrive and produce acorns in what looks like far from ideal conditions. It has found a niche where few other plants can compete. 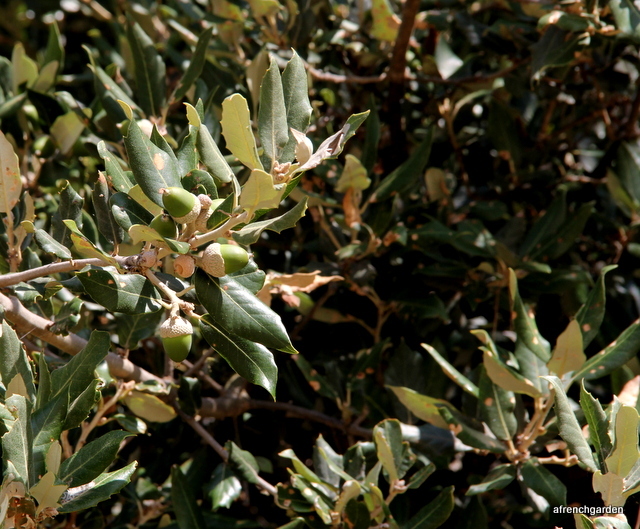 It is a Holm Oak [Quercus ilex] or Cork Oak [Q. suber] see comment below from Dromfit. I had to smile when I saw the clump of ivy hanging on to the edge at the top of the cliff – you would survive almost anywhere, wouldn’t you! 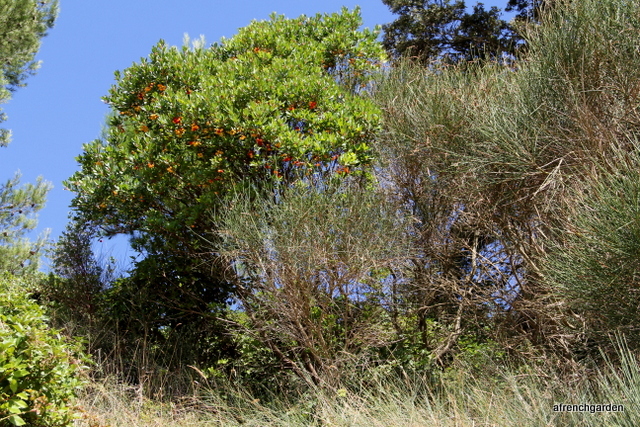 A strawberry tree sits atop the cliff with a beautiful view out to sea. It is full of its strawberry fruits now and does not object to the sea air. 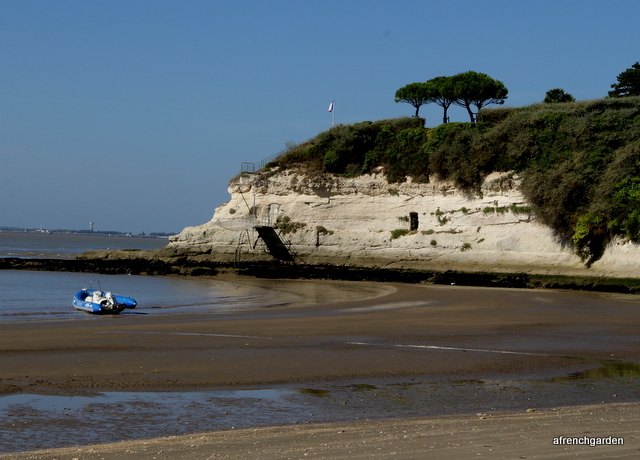 It is low tide on the estuary in the picture but the carrelet is just visible on the side of the cliff. These are strange constructions that are very common here and consist of a little cabin supporting a huge net that can be lowered and raised to catch fish. See my post “The call of the sea” for better pictures. 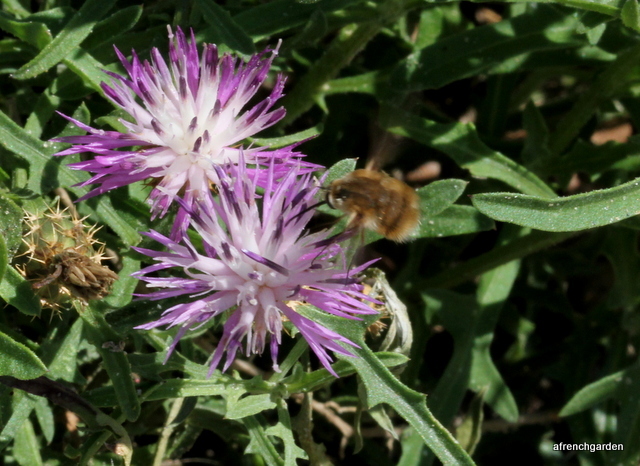 But of course what really fascinated me was the clump of a kind of knapweed as it was full of bees and butterflies. This is a Megachile, perhaps maritima. 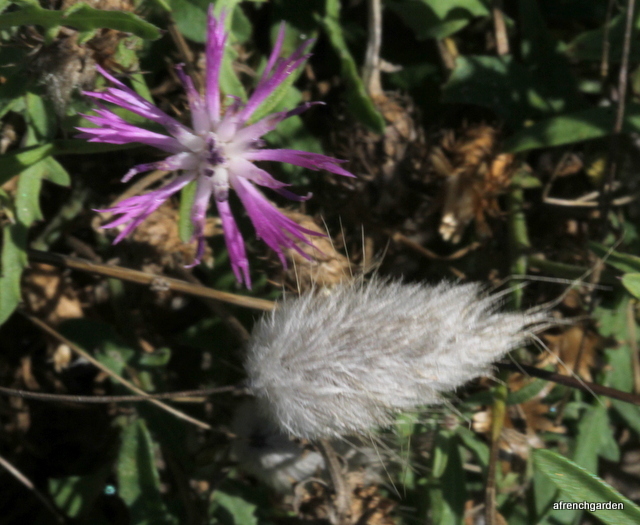 The knapweed grows on the dune at the base of the cliff on a substrate that looks like sand. 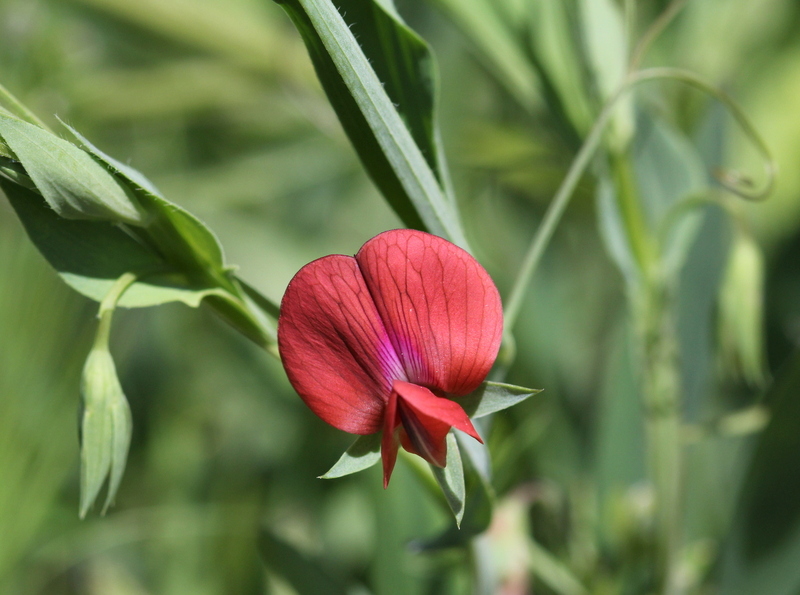 However, it grows in the full sun and its flowers produce a sought after nectar for nearby pollinators. I have never seen this fluffy Megachile before, he has such downy front legs as if he was carrying a muff. It may have been the male of the Megachile maritima. Talking of fluffy things some of the grass Lagurus ovatus was growing beside the knotweed. 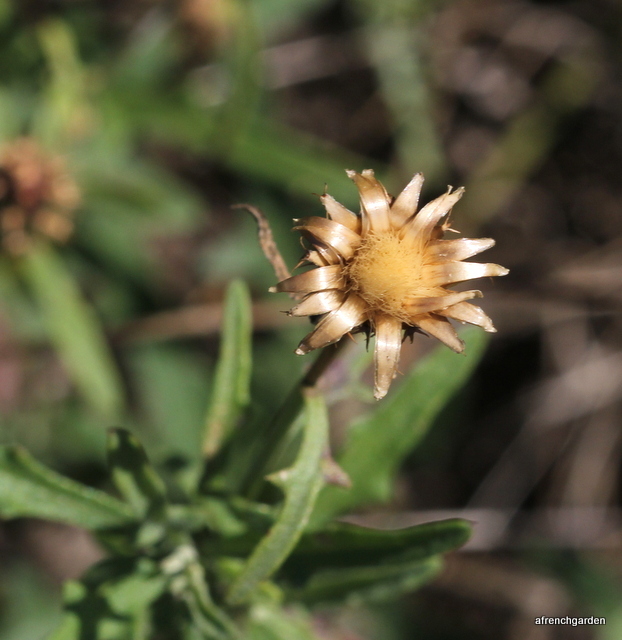 I often see this growing more inland and it keeps well if cut for using as a dried flower. I like the French name “queue-de-lièvre” or hare’s tail. I think it would tend to call it bunny tail. I was quite excited seeing all these new Megachile but something was buzzing them as soon as they settled and I had a good idea what it was. I finally got a photograph of the culprit, Anthidium manicatum, the wool carder bee. He can be a bit aggressive towards other bees and does not like sharing “his” patch of flowers. This is another Megachile I have not seen in the garden, yet. 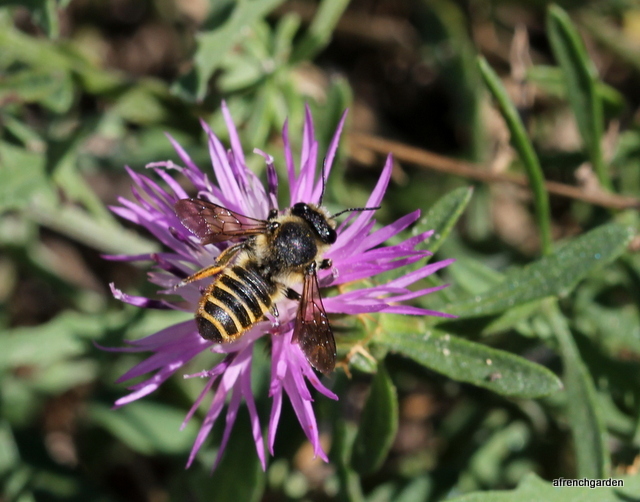 It may be Megachile versicolor as its orange scopa has dark hairs at its tip. 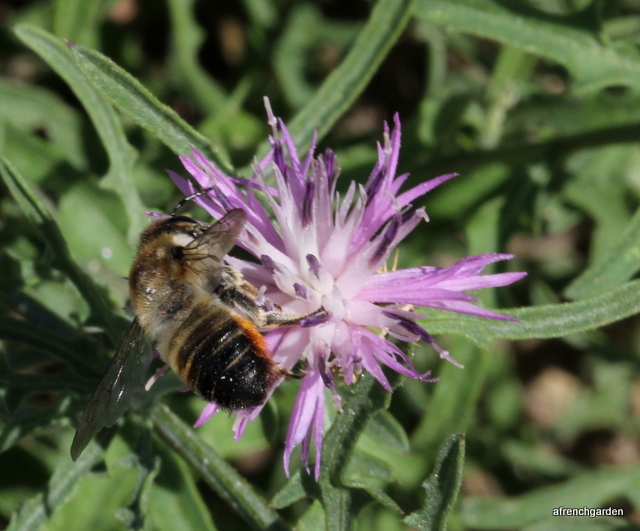 This fluffy insect is not a bee but a bee mimic and a parasite of the solitary bees, laying its eggs on the flowers they visit or beside their nests. 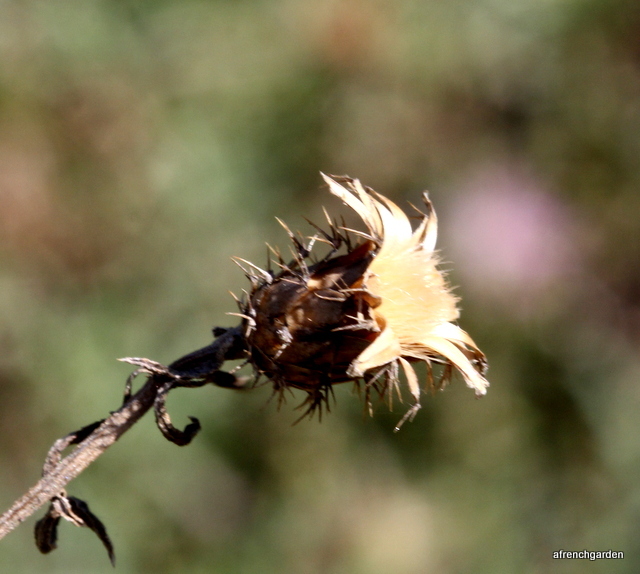 These knapweeds have very sharp raised spines as you can see on this seed head. I have no idea what the species is but it was growing on the dunes at the edge of the beach and is different in this aspect from the knapweeds I find growing around the garden. 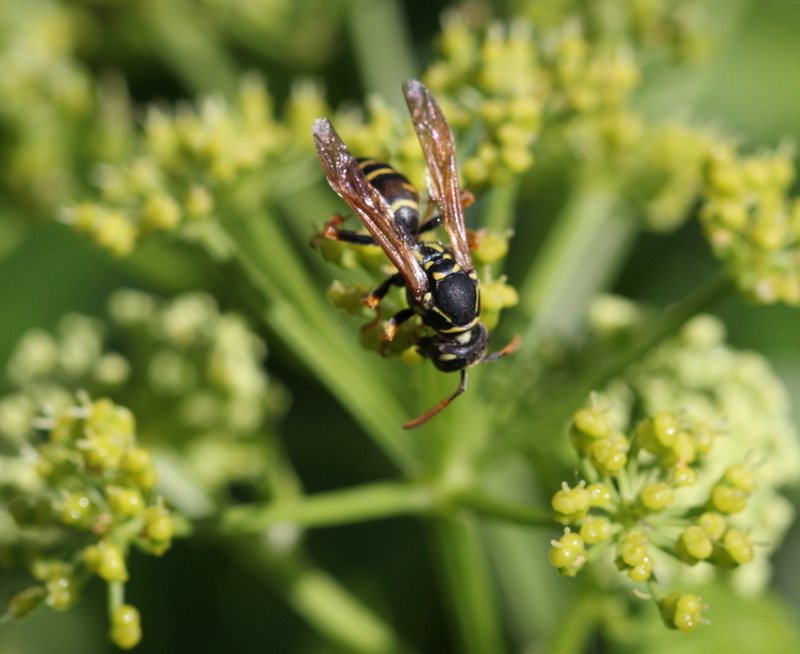 Plants can fill ecological niches that most gardeners would view as impossible and in doing so they open up a path for other species to follow them and provide food and nectar for an uncountable number of other creatures. Humans on the other hand decide that to grow plants it is essential to change the balance and nature of the soil with artificial fertilisers, then spray them with pesticides to control the insect life and herbicide to ensure their crops are not out competed by other plants. Unfortunately, the world is now suffering from this basic lack of understanding. 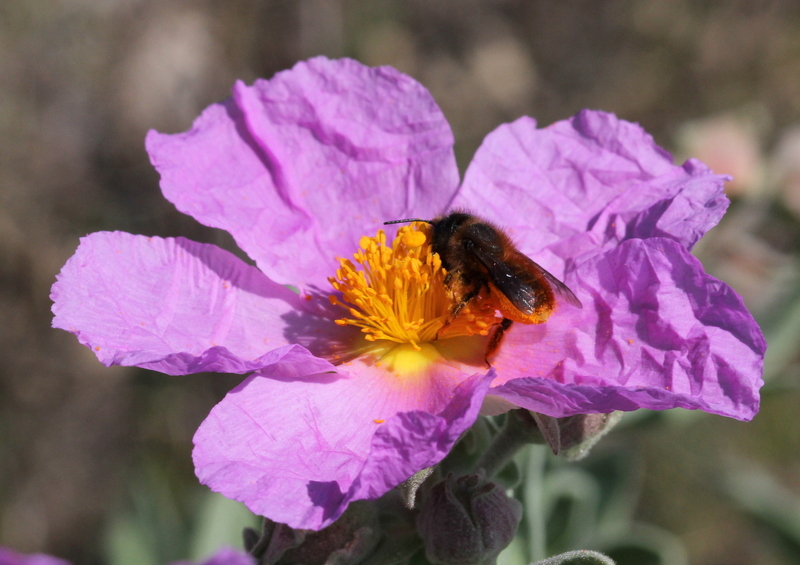 Categories: Life | Tags: bees, crithmum maritimum, France, gardening, limonium vulgare, megachile, nature, rock samphire | Permalink. I promise; I promise, this will be my last post on behalf of Amelia who will return back home tomorrow. 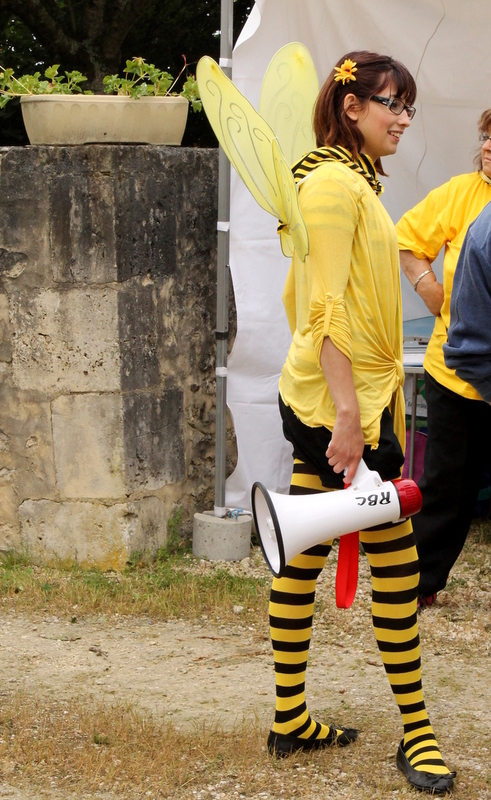 However, I could not resist sharing with you all, my visit today to the Fête des Abeilles – The gathering of the members and the friends of the Association of Apiculture of the department of Charente Martitime, where we live. By this time of the year, that is to say the summer solstice, we should have really nice weather, and we have had two or three days when the temperatures soared to about 30 C [that is about 86 F]. But sadly today was not one of those and although it was not cold at all, we had a drizzle most of the day. 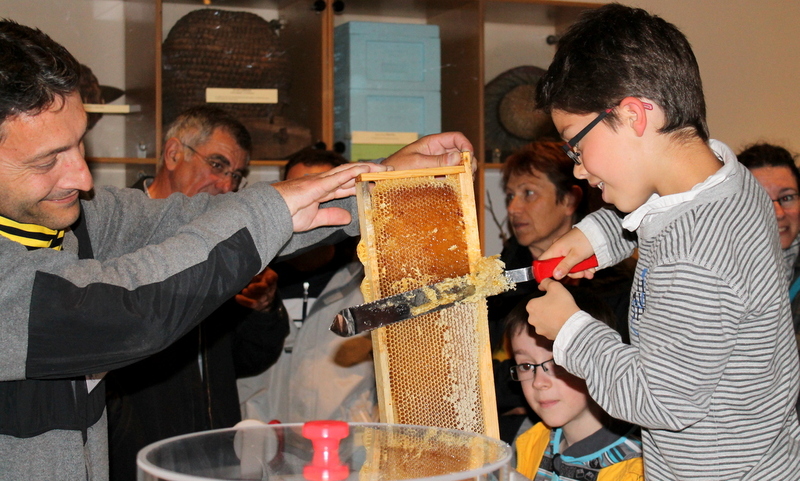 But it did not deter the people and they came to see the main attraction which was the extraction of honey. For me, however, the great excitement was something else that I had never seen at close quarters. They had chosen an interesting location which is a center recently opened to study and shelter wild birds along a corridor of the busy motorway A10 which runs between Bordeaux and Paris. 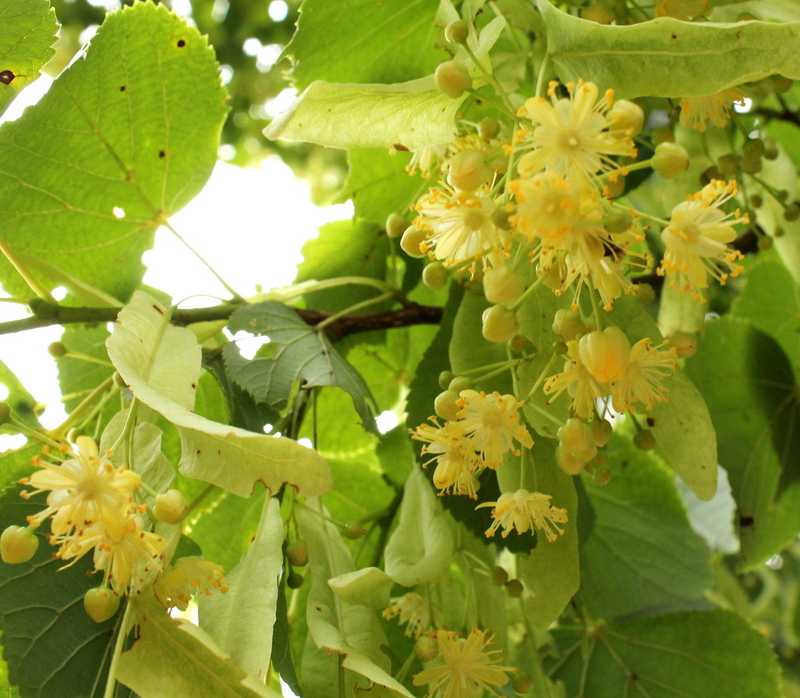 On one side is a forest and the several acres of land was purchased partially because it has a lot of lime trees, in full flower at this time of the year. Those perfumed flowers produce some of the best honey I have ever tasted. For that reason, different members of the association of apiculture have left some of their hives in that center. 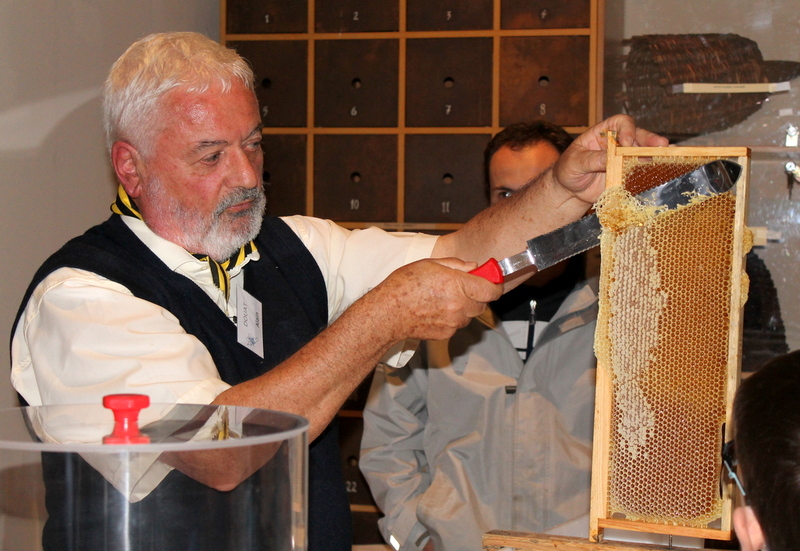 The extraction was demonstrated by one of the members who had opened one hive and had removed a few of the elements. He first showed how with a special knife the waxy coating was to be removed. They were very keen to encourage and educate the participants, specially the curious young children. 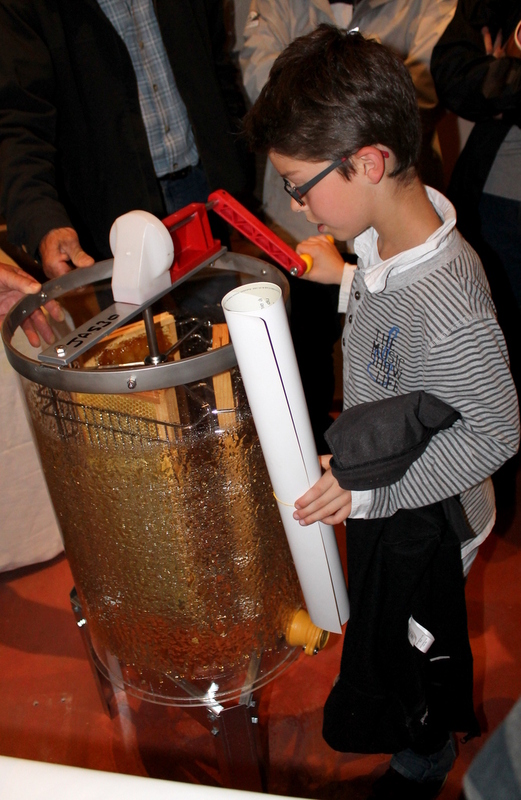 Several children participated in the preparation of the elements for extraction. They even placed the elements in a transparent extractor and were in a practical manner taught how the centrifugal force works. 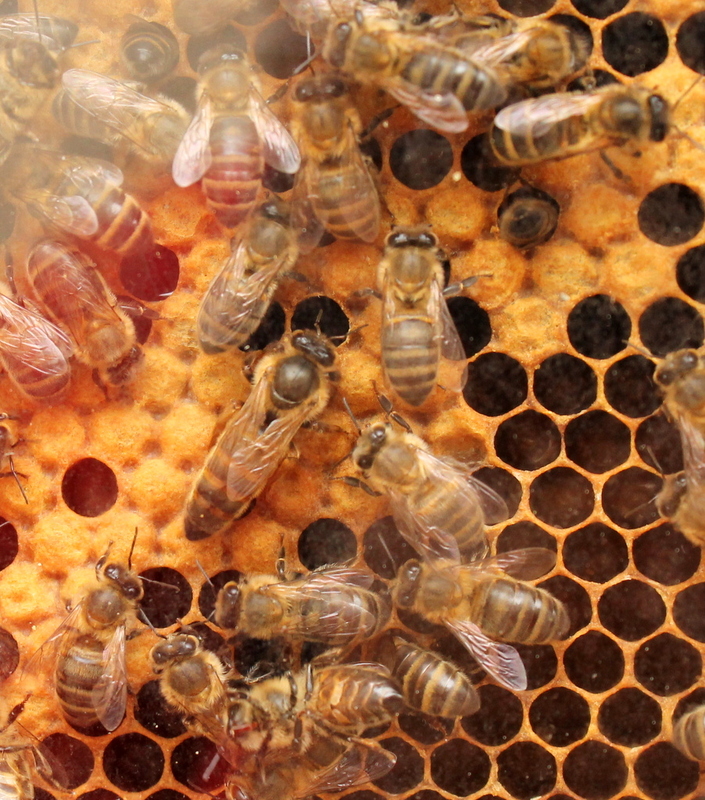 But as I said for me the absolute excitement was being able to see her majesty the queen bee in her court. She is not normally removed from her hive, but this day when Michel had removed one of the element for transport in a glass hive, he had not noticed that he had also transported the queen. She is in the middle, larger than the others with a prominent back – may be it is there she wears her crown! Michel assured me that a separation of a day should not disrupt the harmony of the hive. I was so absorbed by the events of the day that I did not notice until I was leaving that there was another queen bee amongst us. 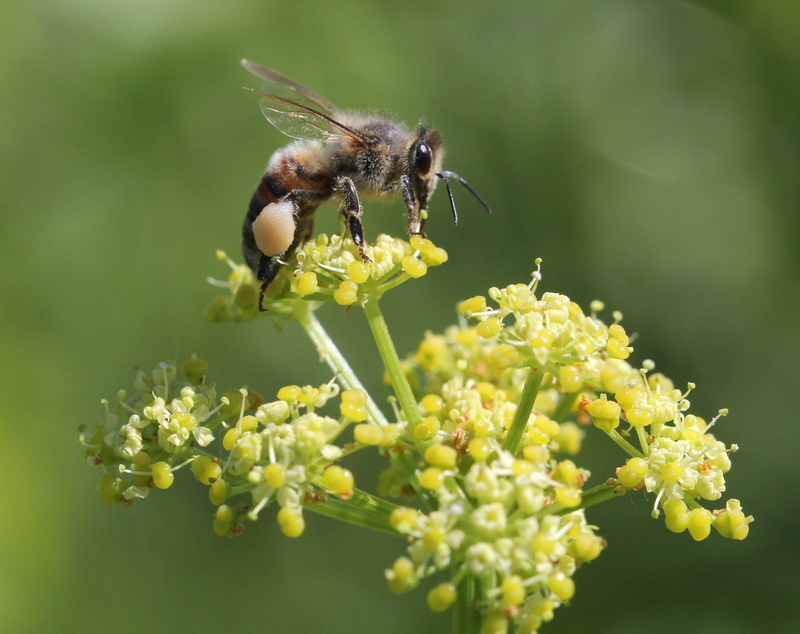 Categories: Life | Tags: bees, Charente Maritime, fete, France, honey, life | Permalink. Arriving in the U.K a few weeks ago I was given a present by my sister. She had been listening absent-mindedly to BBC Radio 4, while driving, when the words “bees” and “Charente” made her tune in to the programme. She managed to absorb that they were discussing a book “A Sting in the Tale” by Dave Goulson and took the chance that I might find it interesting. Usually I read my books very methodically reading any introductions etc. to begin with; however, I noticed a chapter “Chez Les Bourdons” so I couldn’t resist finding out what it was about immediately. A bourdon is a bumble bee in French so I thought it might be devoted to the identification and natural history of French bumble bees. It was about his experiences in buying a small farm in the Charente. This realised a dream to have land he could manage for nature and of course for bumble bees. I felt an immediate empathy for him as we had bought our house and garden in the Charente-Maritime at about the same time. I turned to the beginning of the book and started to read from the beginning with even more enthusiasm. His style is very readable and personal. If you ever wondered what Biology professors are like when they are little boys, now is your chance to find out. He lightly traces his own life through his academic career with lots of anecdotes which never come to light reading the formalised style of a research paper. 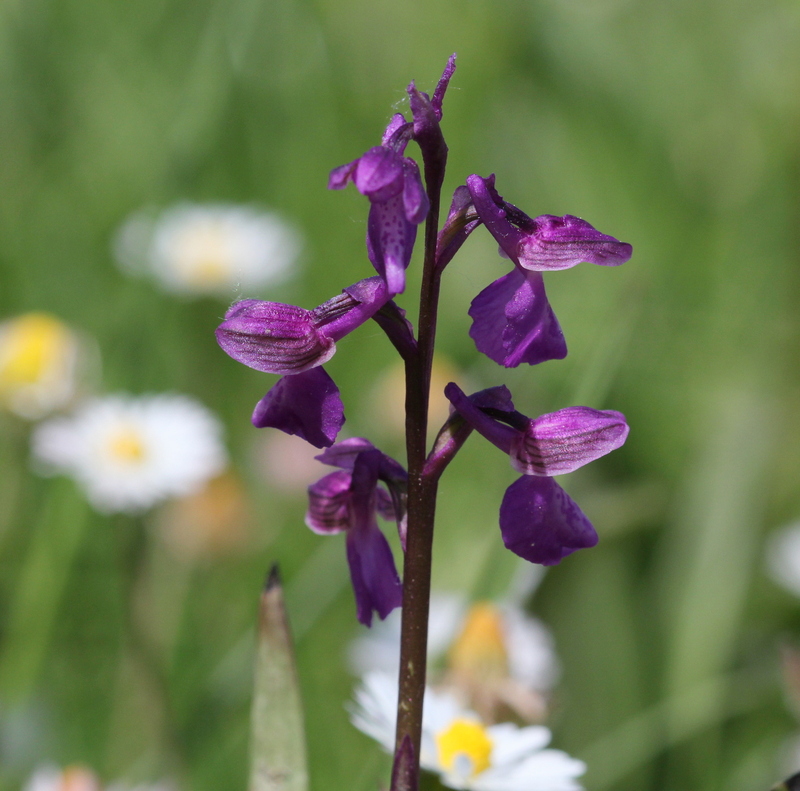 He is hoping to create natural meadow land on his land in France and is experimenting to compare the different techniques of returning the farm land to flower rich meadow. His ownership of the land secures this long term project from the vagaries of budget cuts and direction changes in funding bodies. I was also fascinated to learn how bumble bees had been introduced to New Zealand in the late nineteen century to help the pollination of red clover being grown for fodder. They were, of course, not the only animals and plants the settlers imported to “improve” their new home. However, the short-haired bumble bee has now disappeared from the U.K. Reading about the efforts being made to reintroduce the short-haired bumble bee to the U.K. brought home the problems man has created in his efforts to “improve” nature. Even seemingly harmless bumble bees can upset established ecological systems as Goulson has seen for himself on his visits to Tasmania. Australia has no native bumble bees but buff-tailed bumble bees (Bombus terrestris) which are excellent pollinators for tomato plants appeared in Tasmania in 1992. Of course, the importation of non-native bees is forbidden in Australia and New Zealand but the first bumble bees were observed in Tasmania in 1992 which strangely coincides with the commercial production of bumble bees for pollination, particularly for tomatoes. He explains in his book how the seemingly harmless introduction on a new species of bumble bee has effected visible changes in the ecology of Tasmania in a short period and speculates on possible future changes. The book is full of personal stories and you can catch a backstage glimpse of the creation of the Bumble Bee Conservation Trust, the charity he set up for bumble bees in 2006. 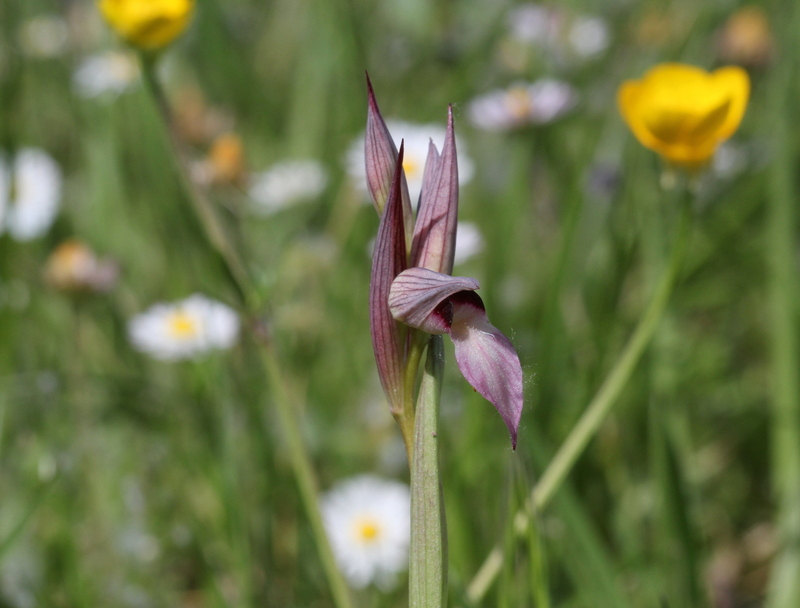 One of projects of the Trust was to re-introduce the short haired bumble bee to the UK. Once again the book offers you a very person peep into the beginnings of this fascinating project. 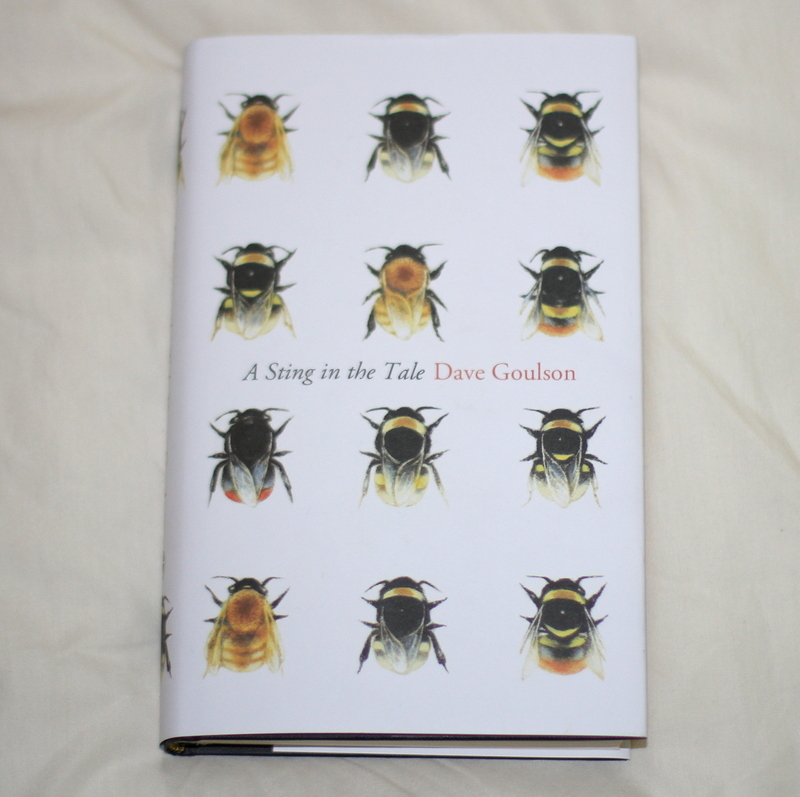 Goulson endeared me by admitting that one of the reasons he started to study bumble bees was that they were “rather loveable”. I think whether you are a bumble bee person or just interested in nature and life you will find this book a fascinating read. 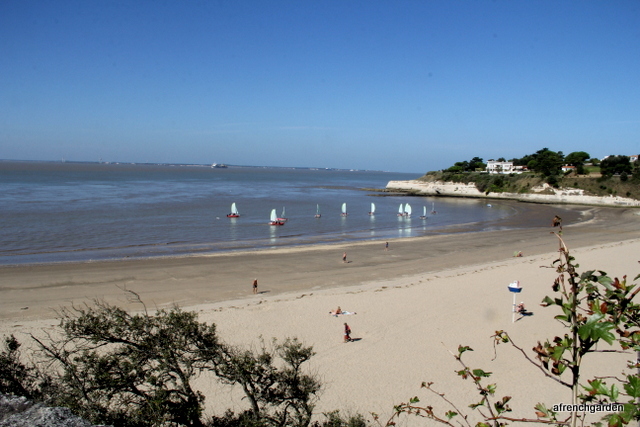 Categories: Life | Tags: bees, books, bumble bees, Charente Maritime, France, nature | Permalink. When I visited Minerve in the Languedoc-Roussillon last week we parked in the visitors car park outside the village which must be reached on foot. The car park was well designed and the light stream of visitors parked and followed a well-trodden path for their initial view of the beautiful village. Afterwards they followed the paths to the village pausing to take in the scenery and the atmosphere. Alongside the path the wild flowers were growing in abundance and the wild bees were out in their numbers. I think this is a Cistus incanus which is a Mediterranean plant so I’m not sure whether it has arrived here by itself or it is indeed native to this area of southern France. It is so beautiful and provides the perfect foil for my bee which I think is the same Osmia cornuta which is nesting in my bee hotel in the garden. The Osmia do not collect pollen on their legs. The female Osmia have a brush of pollen-collecting hairs on the underside of their abdomen. I was engrossed in my bees when I heard a voice from a party returning to the car park and explaining to a child that “The lady was taking pictures of the flowers”. The child was obviously more interested in what I was doing than admiring the view and I’m sure would have been fascinated with all the bees. It made me wonder how many people tread the well-trodden path and do not look any further. After we left Minerve we followed a descending road but stopped at a marked view point. The view was truly remarkable but when we looked a little further we found an abundance of wild flowers. 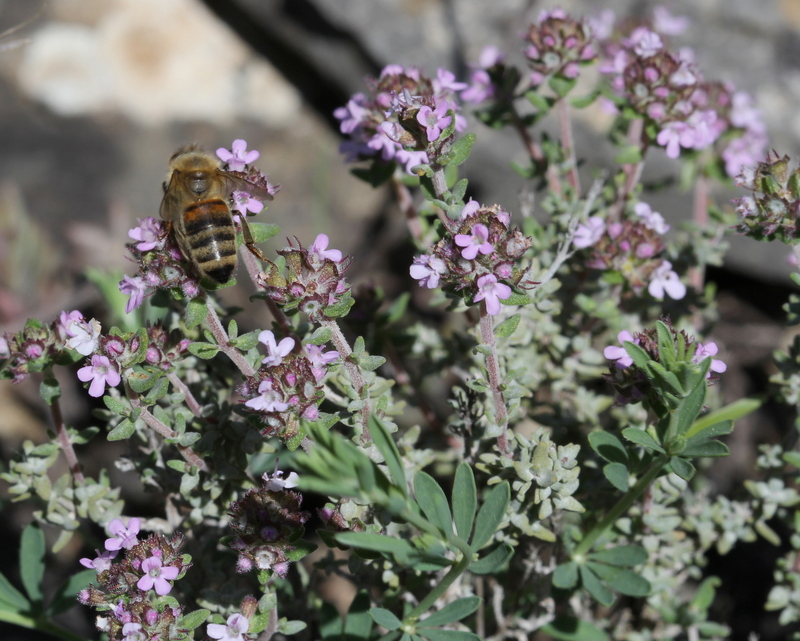 The bees have plenty of forage at this time of year and were visiting the wild thyme. 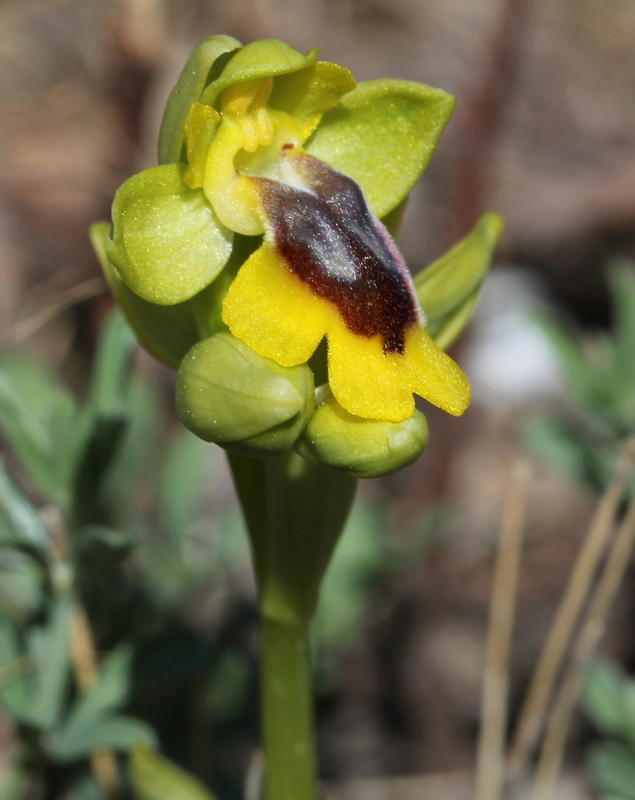 Just off the path were yellow orchids, Ophrys lutea, I think. 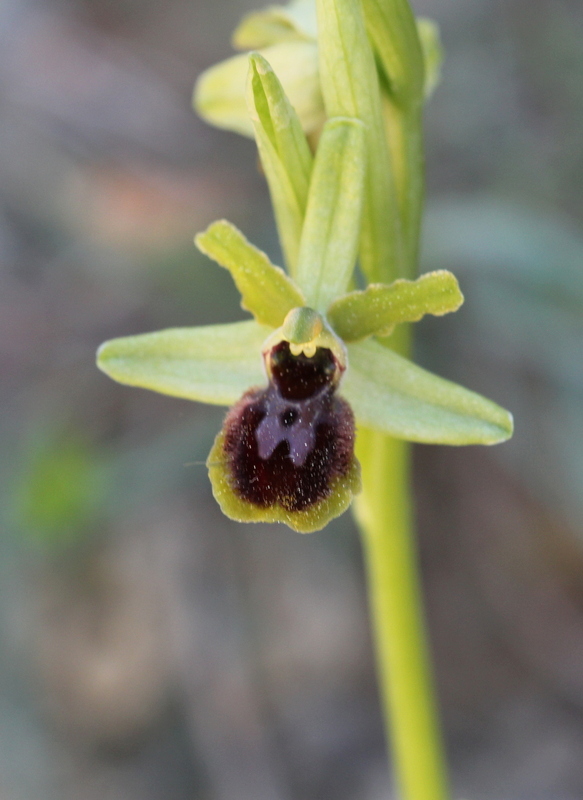 Close by was another which I think is the Spider orchid Ophrys aranifera, which doesn’t look to much like a spider to me. This beauty was pushing up here and there, not as large or rambling as the sweet peas but just as attractive. A peach tree had already set fruit testifying to the mild climate of the area. An almond tree was also in fruit with some of last years fruit still on the ground and edible. Still, like good tourists we pressed on to our next stop and took in the views until the bees called again. The cow parsley was attracting lots of bees and other insects. 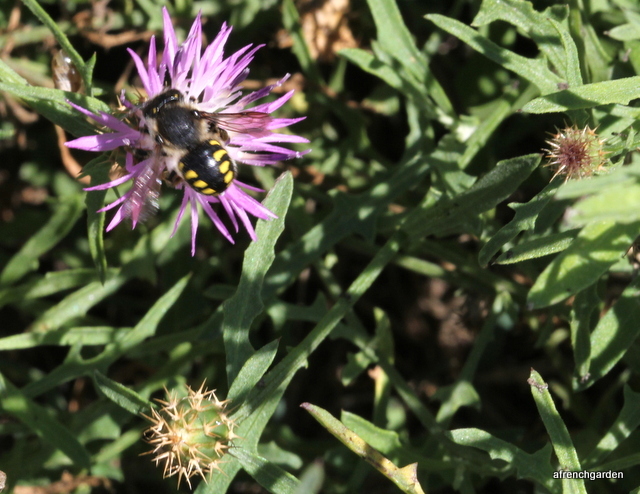 This is a cuckoo bee, I cannot be more precise for the species. 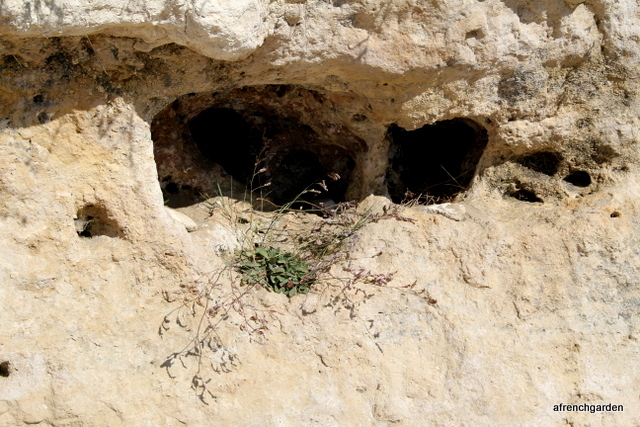 These bees do not build their own nests but lay their eggs in the nests of other bees. 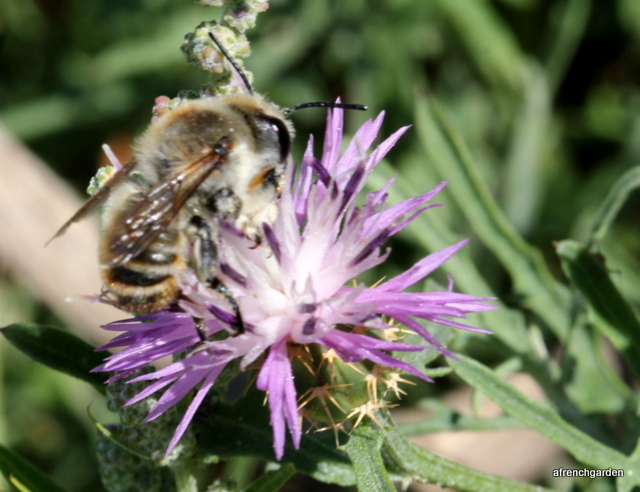 Their young will be nourished on the pollen and nectar set aside by other bees, quite like mining bees of the genus Andrena. I was lured back to the straight and narrow by the promise of an ice cream in the village, so I left the bees and my photographing. It made me wonder though, how often we follow the well trodden paths and how much we miss in doing so. Returning home on the motorway we stopped just outside Agen. The weather was fine and we really needed to stretch our legs. It was the usual petrol station/restaurant set-up but they seemed to have gone a little bit further than many in France and provided more places to sit and a pleasant play area for the children. Just across from the play area we found – yes, more orchids. We don’t have to wait for a signpost or a well trodden path to find something of beauty. 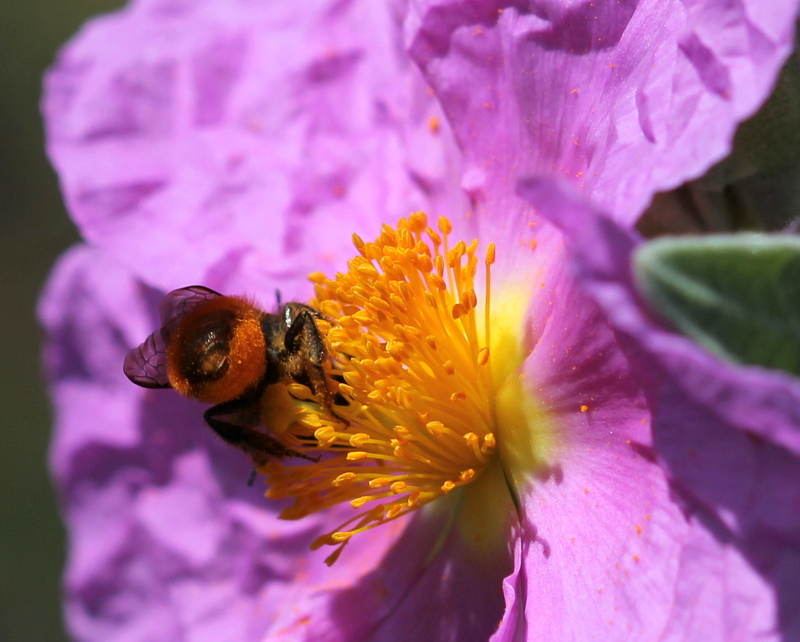 Categories: Life | Tags: bees, flowers, France, nature, orchids, photographs | Permalink. Old tights, a dead tree and human hair. On one of our walks a few weeks back we noticed something hanging in a vine field that we had never seen before. In fact, as we got closer we could see there was more than one. I immediately thought that packages of herbs had been suspended on the wires to ward off unwelcome insects and was curious to find out what they could be and whether it was something I could consider imitating in the garden. The package looked as if it was home made, using recycled tights which seemed an economical method of distributing the treatment. I thought I could hazard a guess at what the herbs might be if I took a closer look but when I got near I could see it was not herbs but hair inside the tights. What is more – it definitely looked like human hair! There is something about cut human hair that makes me shiver. While it is still attached to someone’s head it has quite a different character but once cut; it remains human but unembodied. 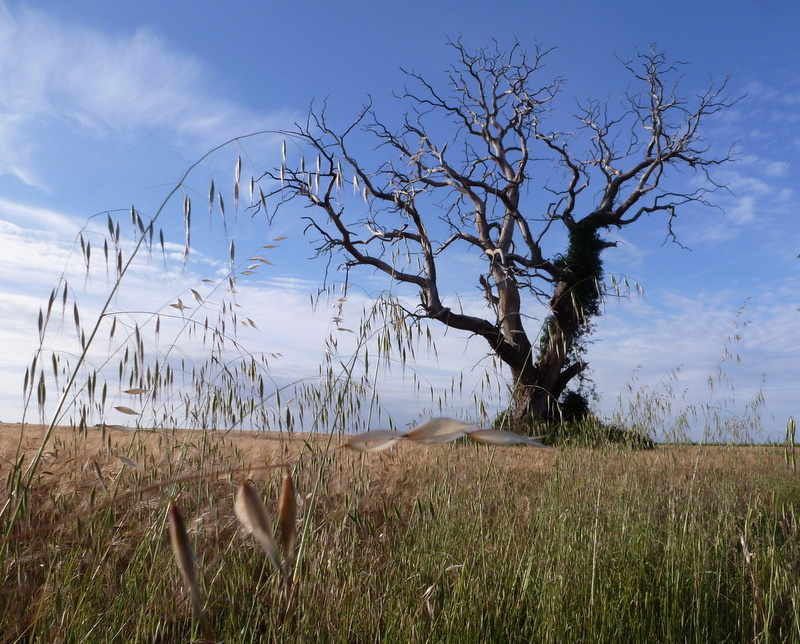 A lone dead tree guarded the field, itself remarkable and stark against the horizon. We came home with no comfortable answers to the questions we were posing ourselves. 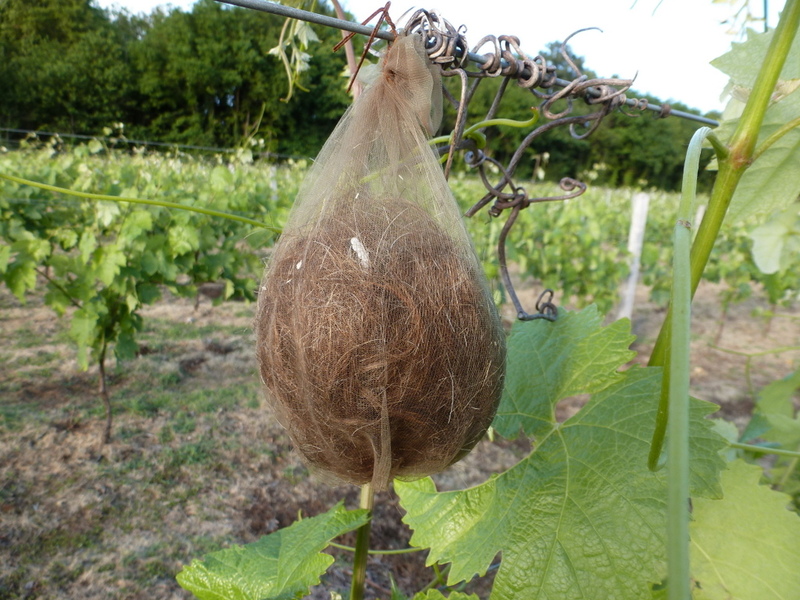 I plucked up the courage to mention it to a few people but questions of the sort, “Do you often hang packages of human hair in the vines around here?” were getting negative responses combined with strange looks. It was an uncomfortable feeling but it aroused my curiosity. In the end I asked my neighbour who is in charge of the local hunting club, he smiled, understanding my concern, and to my surprise he admitted that it was actually him who had put them up! 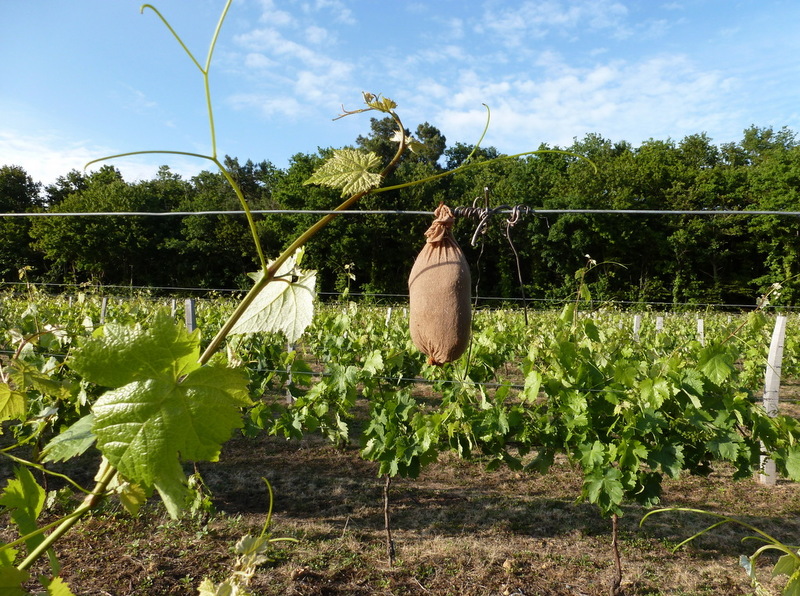 It is an old method to protect the young vines from damage from the Roe deer (chevreuil). I had not noticed that the vines were young. The alternative would be to erect fences to keep the deer out which would be expensive and limit access. It was indeed human hair that he collects from the hairdresser and stuffs into old tights. The packages are then sprayed with cheap eau de cologne and this deters the red deer during the period when the shoots are growing rapidly. The packages are sprayed periodically with more eau de cologne, but to be honest I never got that near to the tights to notice any perfume. He assured me it was a very old method but not widely used these days. I can sleep more comfortably in my bed now the affair of the human hair has been settled. Categories: Life | Tags: France, gardening, nature, Roe deer, wildlife | Permalink.